I Organized this cross disciplinary seminar at UIUC. I also developed a couple of demos including a 20-node tiled visualization of various layers output from the Parallel Climate Model AND an interactive visualization of global energy consumption from 1965-2002 for 73 countries driven by the data provided by the BP Statistical Review of World Energy. 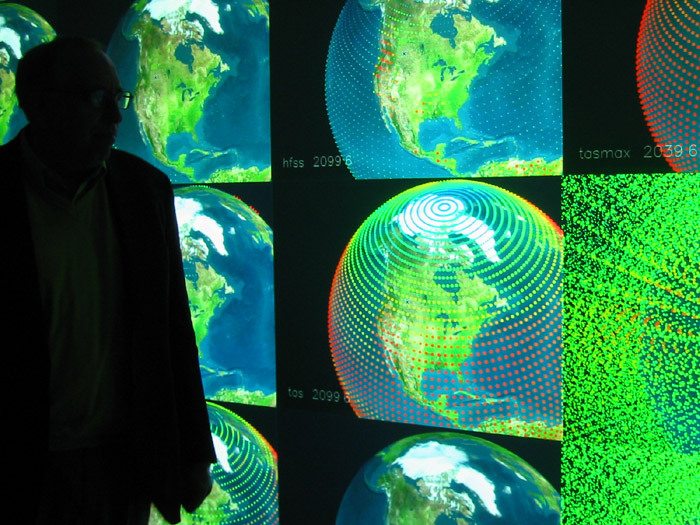 The Parallel Climate Model visualization involved a distributed python backend which consumed, processed and loaded model data to a projected display cluster. To accomplish the data-visualization and navigation on 20 parallel display nodes, I utilized Partiview, an open-source, C++ based, interactive data visualization tool written by Stuart Levy. I was project manager for our groups efforts at this conference. We facilitated a collaboration between Stephen Hawkings lab in Cambridge, England and Mike Norman in San Diego, via the International Grid (iGrid) conference in Amsterdam. 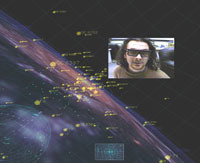 For this we first traveled to Cambridge and setup Stephen Hawkings lab with our Virtual Director remote virtual collaboration software and we had the honor there of meeting with Stephen Hawking, the beginning of a long relationship of collaborations on big science visualization projects.